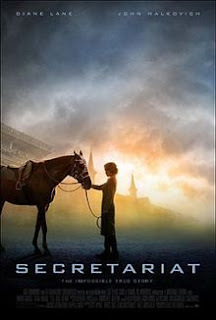 Secretariat is a 2010 American biographical film for Walt Disney Pictures and Mayhem Pictures. The film was directed by Randall Wallace. Diane Lane portrays Secretariat's owner, Penny Chenery, and John Malkovich plays the part of Secretariat's trainer, Lucien Laurin. Filming took place on location in Louisville and Lexington, Kentucky and around Lafayette, Louisiana and Carencro, Louisiana. The film was released on October 8, 2010. The film is based on the true story and chronicles the journey of the race horse Secretariat, the 1973 winner of the Triple Crown of Thoroughbred Racing. Housewife and mother Penny Chenery (Diane Lane) agrees to take over her ailing father’s Virginia-based Meadow Stables, despite her lack of horse-racing knowledge. With the help of veteran trainer Lucien Laurin (John Malkovich), Chenery manages to navigate the male-dominated business, ultimately fostering the first Triple Crown winner in 25 years and what may be the greatest racehorse of all time.